Easy Lemon Chicken Recipe, fabulous, easy to prepare, and ready in just 10 minutes or so. 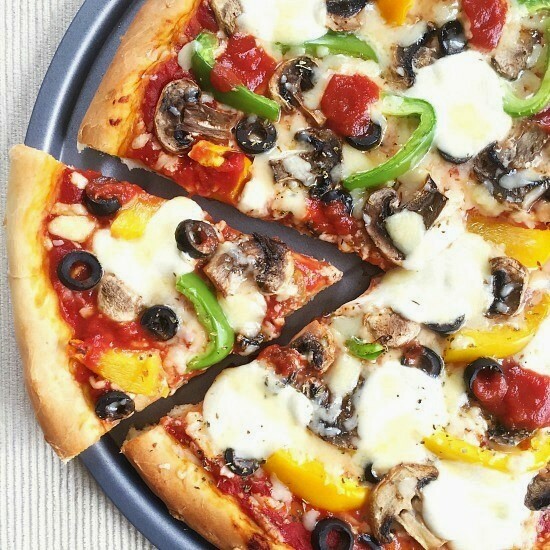 Serve it with peas or any other vegetables, and you can even add some good old carbs like pasta of any kind or rice for a delicious meal for two. Who said homemade meals have to take forever to cook? I’ve been planning to make a lemon chicken dish for quite a long time. After the ever so popular baked honey mustard chicken, l knew honey works perfectly well with chicken, surprisingly, so another recipe with the lemon and honey combination was due now. And the wait was so worth it, this recipe is too delicious, safe to say it’s going to be on the table again fairly soon. Now, l have to brag about my recent purchase, the amazing cast iron skillet. Can you believe it’s the first time l get my hands on one? I had looked for one before, but always postponed buying it, for some unknown silly reasons, obviously. In the UK they are not as popular as in the US, so hard to find iron cast skillets in shops, you have to order them online. It’s by far the best purchase in a while now, and given my ever growing love for shopping, you can imagine how happy I was to get it. Now, I have not tested this recipe in the oven, so I can’t tell you anything about timing. Although I can take a guess and say the chicken would probably need at least half an hour to cook. But if you choose to fry it like I did, it’s ready in no time. What’s absolutely necesary is to halve the chicken, so it can cook properly. A thick piece of chicken breast would not cook properly, unless it’s in the oven, in which case you need not to worry. When it comes to frying, always use thinner pieces. Uncooked chicken can be very dangerous, and you might end up with a bad food poisoning. Not good at all!!! You really don’t need loads of oil though, one tablespoon is more than enough. We don’t want the chicken drenched in oil. And what really gives it the nice flavour is using a knob of butter too. The lemon sauce it’s fantastic, tangy, yet on the sweeter side, giving the dish a fantastic flavour. Do not get rid of the bits left in the pan after cooking the chicken, they make the sauce tastes even better. If you like a sharper taste, use less honey, although I find it the perfect ratio: two lemons and one tablespoon of honey. It really is the quickest and easiest sauce you can ever make, no doubt about it. What a treat for a nice midweek dinner! If you’ve liked my EASY LEMON CHICKEN RECIPE or any other recipe on the blog then don’t forget to rate the recipe and let me know how you got on in the comments below, I love hearing from you! You can also FOLLOW ME on FACEBOOK, and PINTEREST to see more delicious food and what I’m getting up to. 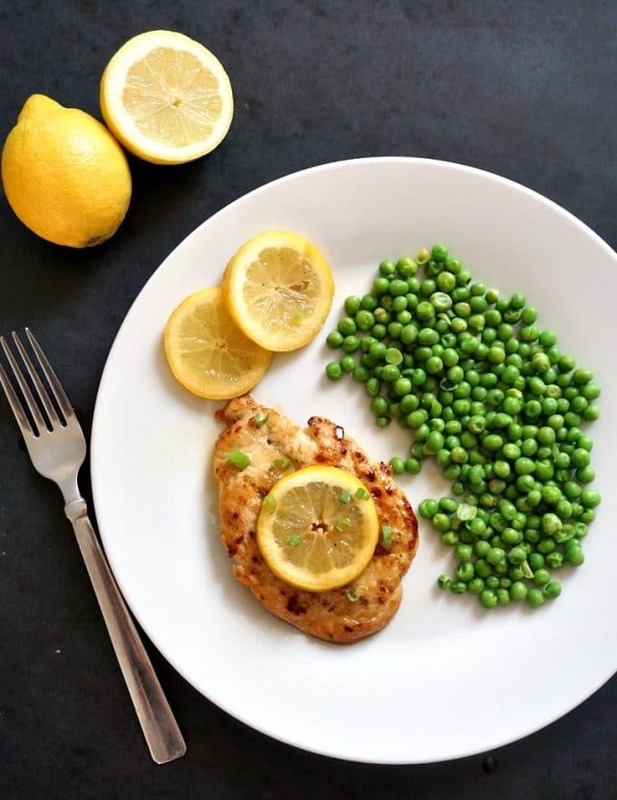 Looking for a lemon chicken easy recipe for dinner? Look no further, this is the very best lemon chicken recipe. With a sweet and tangy lemon and honey sauce, you know this chicken can only be fantastic. Dinner's ready. Halve the chicken breast, cover with kitchen foil and use a meat tenderiser to thinner the slices. Season each slice with salt and pepper, then coat in flour, shaking off any excess. Heat up the skillet, add the oil and butter, then cook the chicken on both sides for about 6-7 minutes or until cooked through. Combine the lemon juice with honey, and add the mixture to the skillet. Stir for about 2 minutes on medium heat until the juice starts to thicken. 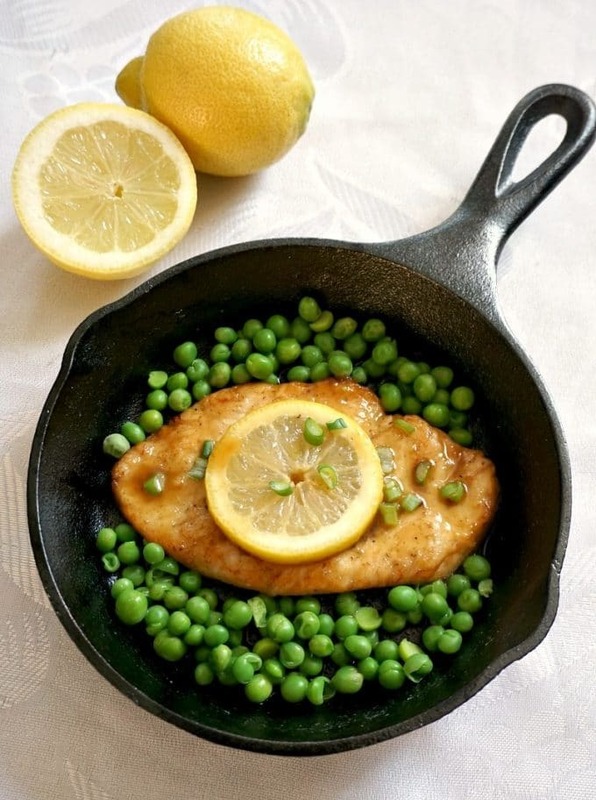 Add the cooked chicken and slices of lemon to the skillet and cook for a further one minute, so that the chicken is well coated with sauce and the slices of lemon are slightly softer. 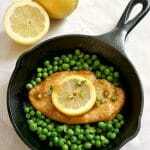 Serve hot with cooked peas and the slices of lemon. I love lemon chciken! This looks amazing!! I love my cast iron skillet and glad you have one now. 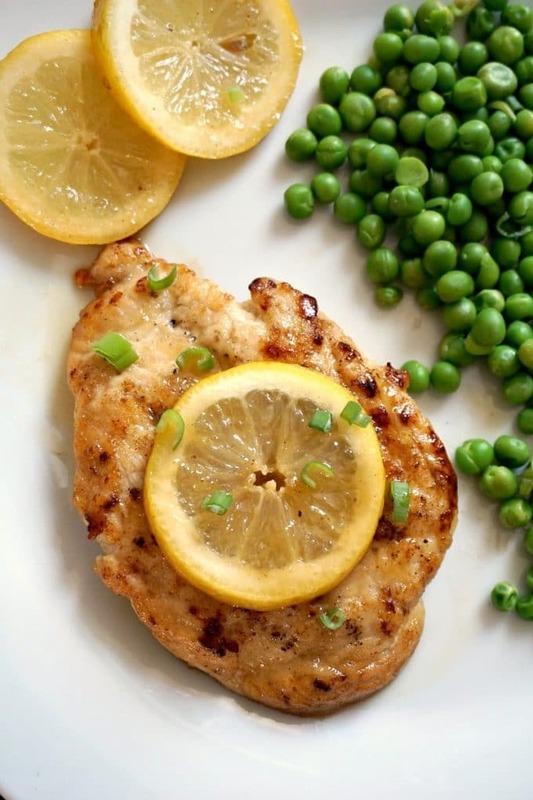 Love lemon chicken and this looks pretty easy to make. thanks for sharing! Mmmm! Love lemon chicken, and everyting lemon I should add, looks delicious! I love lemon chicken and yours looks delicious! 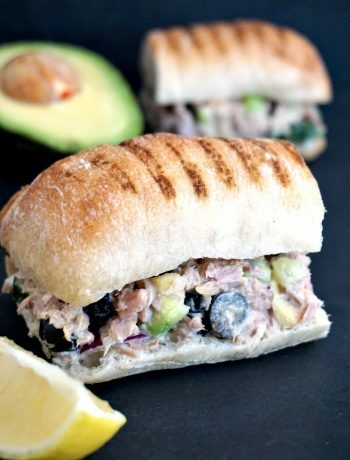 So flavorful & simple! 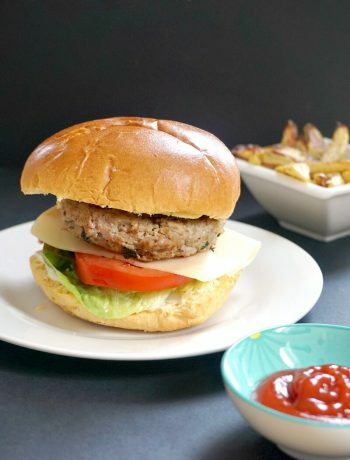 Perfect for a quick summer dish! Lemon and chicken is such a great combo. This looks super yummy. And congrats on your new cast iron pan. 😉 They really are so nice to cook in! Thank you, Tracy! I really like the pan. Tried this last night – with Crack Broccoli and it was one of the best meals I made this year. SOOOO delicious, thank you! Thank you very much for your comment, I am very happy that you enjoyed the recipe, it is one of my favourite.